The Hawaiian Serenaders present Story of the ‘Ukulele and Concert on September 15 in Lahaina, Maui. 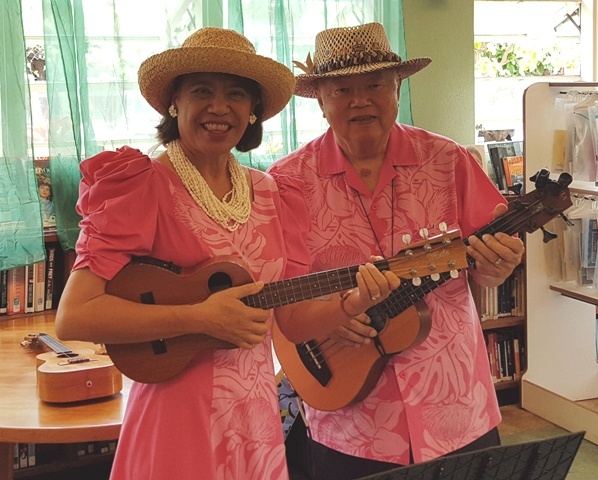 The Hawaiian Serenaders, Richard Tom and Mele Fong, will present Story of the ‘Ukulele and Concert on Saturday, September 15 at 11 a.m. at Lahaina Public Library on Maui. The husband-wife duo play ‘ukulele and u-bass and sing a variety of Hawaiian, hapa haole, pop, and jazz favorites. 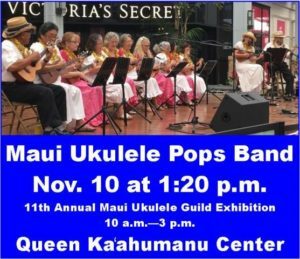 Mele Fong teaches ‘ukulele lessons and will present the history, types, parts, and tuning of the ‘ukulele along with a display of the different instruments. This will be the fourth Story of the ‘Ukulele and Concert at Lahaina Library since 2017. For more information about the event, visit the library webpage. The Hawaiian Serenaders, Richard Tom and Mele Fong, will present Story of the ‘Ukulele and Concert on Saturday, July 14 at Makawao Public Library on Maui. The husband-wife duo play ‘ukulele and u-bass and sing a variety of songs. The Hawaiian Serenaders, Richard Tom and Mele Fong, will present Story of the ‘Ukulele and Concert on Saturday, July 14 at Makawao Public Library on Maui. The husband-wife duo play ‘ukulele and u-bass and sing a variety of Hawaiian, hapa haole, pop, and jazz favorites. Mele Fong teaches ‘ukulele lessons and will present the history, types, parts, and tuning of the ‘ukulele along with a display of the different instruments. 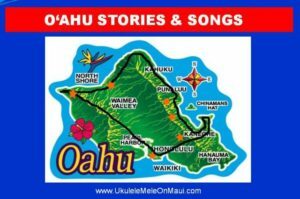 This will be the ninth offering since 2016 of Story of the ‘Ukulele and Concert at public libraries and Kaunoa Senior Center for adults 55 and better on Maui. It’s free! The Hawaiian Serenaders perform at the monthly Picnic for Poki on June 21 at 11 a.m. in Wailuku, Maui. “Roselani Place and Ola Na Mele Productions invite you to join our residents to a Picnic for Poki concert at 11:00 AM at the Historic Kaahumanu Church in Wailuku Town, 103 South High Street on Thursday, June 21, 2018. Our featured guest will be Mele Fong & Richard Tom – The Hawaiian Serenaders. Richard Tom and Mele Fong perform professionally as the husband-wife duo, The Hawaiian Serenaders. They play ‘ukulele and u-bass and sing a variety of Hawaiian, hapa haole, pop, and jazz favorites with a specialty in nostalgic boat days music. The Serenaders are artists with the University of Hawai’i at Manoa’s Statewide Cultural Extension Program, and have represented the state of Hawai’i in concert at the John F. Kennedy Center for the Performing Arts in Washington, D.C. Rich and Mele are both Hawai’i born and raised. Roselani Place, Maui’s premier assisted living community, will have fresh baked cookies, coffee, and water. Attendees should bring a lawn chair or mat and their lunch and most importantly, bring a friend. Picnic for Poki is held every third Thursday on the month to continue bringing the spirit of aloha and Hawaiian music to the Maui community in honor of the late Allen “Braddah Poki” Pokipala. Braddah Poki was dedicated to sharing Hawaiian music and culture through various venues in Hawaii.” — Excerpt from Roselani Place June 2018 newsletter. My husband and I are honored to be asked to perform for Picnic with Poki. We have invited hula dancers from Na Kupuna o Kaunoa to join us on several songs during our one hour+ program of Hawaiian and hapa haole songs. Visit The Hawaiian Serenaders webpage to hear song samples. The Hawaiian Serenaders present a special Father’s Day Concert on June 17 at 10 a.m. at Kula Hospital on Maui. “You made my day. I’m coming early to your Father’s Day Concert so I can sit up front,” commented a Kula Hospital resident after our Mother’s Day Concert. 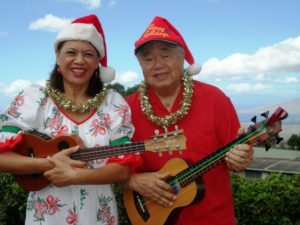 The Hawaiian Serenaders, comprised of the husband-wife duo of Rich Tom and Mele Fong on ukulele, u-bass, and vocals, present a special Father’s Day Concert on Sunday, June 17 at 10 a.m. at Kula Hospital in upcountry Maui. The program includes a variety of fun, upbeat songs familiar to the audience to increase their enjoyment of the music. 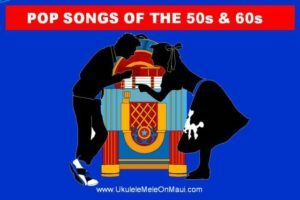 For example, we will perform a few Japanese, Filipino, Hawaiian, and hapa haole songs popular in Hawaii as well as songs from the 1920s to encourage people have fun singing-along to the nostalgic tunes. The last time we performed at Kula Hospital was on Mother’s Day this year when we were received warmly by the patients, their families, and hospital staff. One of the nurses came up to us afterwards and requested that we sing a couple of songs she knows the hula to so she can dance to those songs at our Father’s Day concert. Read more about our Mother’s Day concert here. 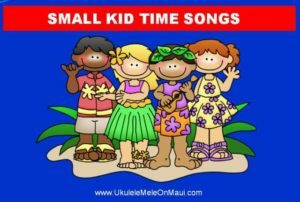 To listen to over 100 audio recordings of songs by The Hawaiian Serenaders that you can learn to play the Ukulele Mele Way with private webcam lessons from wherever you live, click here. To watch us in action, visit our YouTube channel and click here.